* Brady Hotel is offering a discount rate to AGEW2019 participants: Please use the code AGEW2019 when registering to receive a minimum of 5% off the best rate available on all rooms. Booking includes 1GB Wifi daily allowance, conference guest recognition and upgrades if available. Book anytime before the 10 Feb 2019 to receive the discount rate. The deal will be available on booking dates up to 20 Feb 2019. No credit card booking fees. 48-hour cancellation window applies. *Rydges is offering AGEW2019 participants a rate of $182 per night, and $19 for breakfast, using the reservation code AGEW2019. Booking must be made before 31 Jan 2019. Most interstate and international flights will arrive at Melbourne’s Tullamarine Airport (MEL) which is located around 23km north-west of the city. All terminals are serviced by a reliable taxi rank. Taxi fares one-way to the city are usually around AUD$60-AUD$75 (depending on traffic). There is no train connection from Melbourne Airport but the most reliable alternative to taxis is the SkyBus, which will transport you directly from the airport to Southern Cross Station in the city in around 20-25mins depending on traffic. The SkyBus Melbourne City Express fare costs AUD$18 one-way and tickets can be purchased online before your trip on the Skybus website or from the ticket booth at the airport. 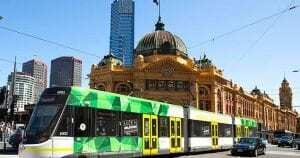 Once you arrive at Southern Cross Station, you can take a free tram along Bourke Street or Collins Street, a short taxi fare, or a 10-15 minute walk, to reach RMIT University and the surrounding hotels in the area. More information about other travel options are available on the Melbourne Airport webpage. The easiest way to travel around Melbourne city is either by foot or tram (light rail). The centre of Melbourne is a free tram zone. RMIT University is located one stop north (around 100m) of the free tram zone. To travel beyond the free tram zone, or to travel on any other public transport in Melbourne (trains and buses), you will need to buy a myki card. You need to purchase your myki card and add credit before boarding (cost of AUD$6 for the card for an adult plus AUD$4.30 for a 2-hour fare). myki cards can be bought at major train stations, most tram stops, and convenience stores around the city (eg. 7-Eleven stores). More information is available at Public Transport Victoria webpage. To help plan your trip, we can advise that the Workshop Dinner will be held at University House on the University of Melbourne Campus, which will be about a 20-minutes walk from RMIT University. Any participants who will be bringing their babies or young children with them, or any participants who have accessibility and mobility requirements, please let the organisers know so we can assist you with information and support (please email us at agew2019@rmit.edu.au).